Adventure's road brings those stout of heart to the Tower's iron bound gate. Whether brought here by the trail of the Vessel of Souls or by pure happenstance, the Tower, perched upon the edge of nowhere, beckons, promising wealth and glory. But this is no abandoned dungeon. Fire-light spills from the windows that adorn its stark stones, and noise from inside carries over the still morass. Here is wealth and plunder, but danger as well, and those who would pry open its doors must approach with some caution, for inside lie ancient powers who reside upon the material planes to feed upon the weak and innocent. 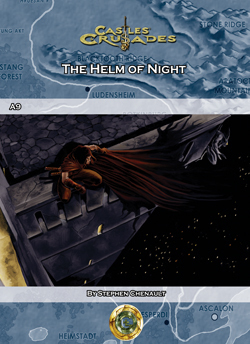 The Helm of Night is an adventure designed for 3-5 characters of 9th-11th level. It is designed for a single night's play or at longest over several sessions. It is fully compatible with any ongoing campaign game or can be played as part of the A series adventure modules. The Helm of Night is primarily an indoor adventure.